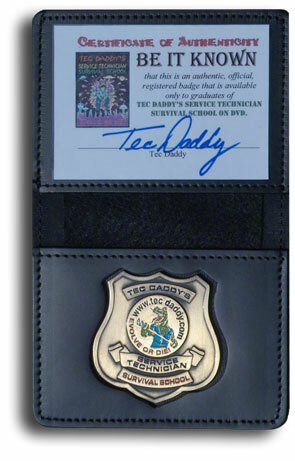 THE OFFICIAL TEC DADDY'S SERVICE TECHNICIAN SURVIVAL SCHOOL ON DVD BADGE! You earned it! You deserve it! Now, show your colors! Certificate of Authenticity (each individually signed by Tec Daddy). These are real "police style" badges made by the same people who make badges for law enforcement officials throughout North America. Impress your friends. Reward your employees. Get a feeling of accomplishment.